Nobody wants their children to be ungrateful. We hope that the sweet children we have been given to raise will become kind, loving, compassionate adults. Not greedy, selfish, or uncaring. There may be days those greedy thoughts are all they express. We need to show them how to think of others before themselves, but how? How to help them see the need in others? How to help them be compassionate? How to help them be a blessing to others? Be a blessing to others – and bring your children along. Be living a life that shows love to others, thinks of them first, your children will see first hand what that looks like. Sure, it may be easier to donate to a charity or organization in your community, send in the check and get back to your busy day. Or even a step further, ringing a bell outside a store for a couple of hours. A much bigger and longer-lasting impact occurs when you actually use your hands and feet, literally. I know it is not easy to get involved when you have children, sometimes the environment is just not child-friendly. That’s why I, along with my children, have gathered some ideas. Not all opportunities are suitable for all ages, but there will be a thing or three that you can do to be a blessing, with your kids. Get creative, literally. Making cards, baking cookies, tieing a fleece blanket, and crocheting a scarf are all hands-on ideas to bless just about anyone, from children in a hospital, elderly living alone, veterans in a nursing home, or homeless in shelters. Take your talents on the road. Cleaning, shopping, yard work, gift wrapping, or singing are all ways you can do for others that cannot easily do for themselves. Pick and choose what skills you have, the ages of your children, and the people in your community you want to bless. Visit a nursing home and sing carols. Before my father-in-law passed away, we spent most Sundays visiting him at the Veterans’ Home in our state. The residents loved visiting with our children. It is amazing how a child-drawn picture, a treat, and a little time brightens a person’s day. Bring cookies and visit if you feel comfortable doing so. Store bought or homemade cookies are equally enjoyed. We’ve included a favorite recipe in our Be a Blessing Guide. Donate gloves, hats, and mittens to a homeless shelter. Remember all sizes and genders, shelters that serve families will love this. We pick up an assortment from the dollar store. Make a birdseed ornament to hang outside. It is such a joy to watch wildlife out your window. This is a double blessing. You can be a blessing to wildlife and animals, too. We have an easy recipe and instructions in our Be a Blessing Guide. Volunteer at your local animal shelter. As a family, you can do some cleaning and cuddling of puppies and kittens. Older children can do even more. blessing a family. Do this for a few nights, and you could have 3-4 ready-to-heat meals that your elderly neighbor can stash in their freezer. This is also appreciated by families with a new baby, recent surgery, ill child, etc. Babysit so a mom of littles can shop. If the children are similar ages to your own, treat it like a playdate and have fun together. If you have teens, they can babysit for no charge. Have a bake sale and collect donations for a local group – whether that is the humane society, a homeless shelter or some other organization where you can be a blessing. A simple no-bake recipe even little ones can help with is in our Be a Blessing Guide. Help an older neighbor clean up their yard. Rake leaves, shovel driveway and sidewalk, ask what they need to be done. Shop for a neighbor. We have been doing this for my mother-in-law for a few years. She uses a cane and large grocery stores can zap all of her energy for a whole day. We do her shopping when we are out doing our own. This is a great task for a middle school age child. They can follow a list and fill their own cart while you gather your own things (or vice versa). And as a homeschool mom, I have them try to keep a running total and see how close they are at checkout. Don’t have a neighbor to bless in this way? Shop for basic shelf-stable foods and donate to a food bank. Knit hats or booties for babies or nursing home residents. There are numerous free patterns and tutorials if you know the basics of knitting or crocheting. While you are baking all those cookies, drop off a box or two at your local fire, police, or sheriff’s department. Our first responders are often working during family celebrations and gatherings. Blessing cards – Cheery, hand-drawn cards help remind people that they are cared for. Make them for specific individuals or randomly bless someone with a card. Make coupons for Being a Blessing all year round. Washing a car, mowing a lawn, walking a dog, planting annuals or weeding a perennial bed are great spring and summer activities to bless a neighbor. Gift them the coupons now and they can “cash in” later. Loving our neighbor as yourself has no age limit or time constraint. During the holiday season when children make lists of things they want, show them how to invest the time in others. When you are blessing others, you will find you are blessed yourself. Hillary is a busy mom who sees the beauty in her everyday, simple life. Her happy place is a book, a cup of tea, and surrounded by family. 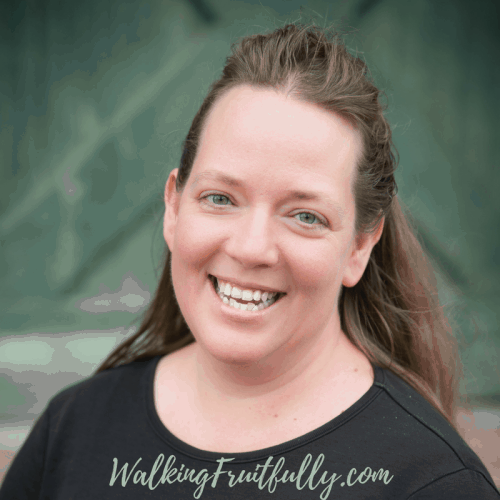 We share encouragement, tips, and recipes for other families seeking a homesteading, homeschooling simple life at Walking Fruitfully.